A Trinity side packed with new faces succumbed to a 31-7 defeat in College Park last night. 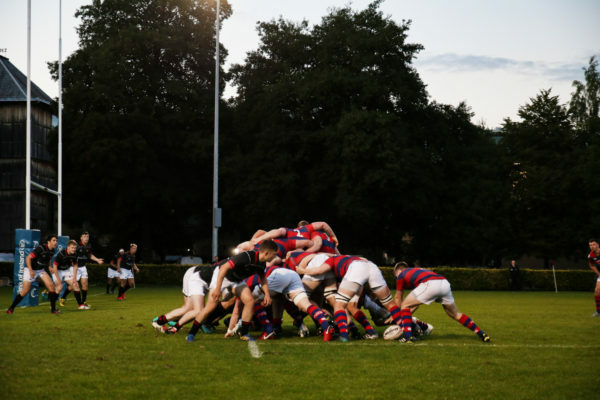 A Clontarf side packed full of former Dublin University Football Club (DUFC) stars proved too strong for Trinity in College Park, strolling to a 31-7 victory in what was DUFC’s second Leinster League fixture of the season. Angus Lloyd, Paddy Finlay, Jack McDermott and former captain Michael Courtney, who all played key roles last season as DUFC comfortably avoided relegation, were clad in red and blue against a DUFC starting lineup packed with new faces. With many of his key men on provincial duty, head coach Tony Smeeth gave starts to many of the under-20s squad that claimed silverware in the Fraser-McMullen Cup last season. The game took time to get going, with both sides wearing the look of pre-season sides yet to fully gel. Patrick Nulty’s slaloming run took him through a gap in what looked like a suspiciously porous Trinity defence, but he was grounded just before the line. At the other end, James Hickey also made a promising break, but it came to little in the end. Trinity’s Darragh Porter was guilty of a knock-on after a gorgeous looped pass from James Fennelly looked to have set him free of the visitors’ defence. It was Clontarf, though, who made the breakthrough, fullback Ariel Robles touching down after a subtle offload from Nulty set him loose. Ex-Trinity outhalf Jack McDermott added the extras. Lloyd, ever dangerous, was flitting around the fringes, looking notably sharp for such an early stage in the season. McDermott got himself on the scoresheet with a lovely try in the corner, before Hickey hit back for Trinity not long after. DUFC were showing glimmers of the attacking rugby that characterised their play last season, but in truth they never really got going, and Clontarf’s flying back three of Robles, James O’Kane and Cian O’Donoghue were causing them problems at every turn. Three tries later – including a beauty from Nulty, almost a carbon copy of his first half run but for the fact that this time there was no stopping him – and Clontarf had seen off any possible threat of a trademark DUFC fightback. Substitute outhalf David Joyce looked particularly impressive for the visitors, always composed and ever-creative. For DUFC, there will doubtless be plenty of lessons in defeat as Smeeth seeks to rebuild his squad once again before they kick off the Ulster Bank League campaign with a tricky away assignment to last year’s beaten semi-finalists Garryowen.